Sean Connery returns to the role of the world's most famous secret agent in this blistering reworking of "Thunderball" which the 'Daily Express' referred to as "...more appealing than ever... superbly witty and entertaining". Brought out of retirement by 'M', here played with dry humour by Edward Fox, Bond is put through a rigorous training course and then sent to a health farm to recuperate. It is here that he stumbles across the foundations of a plot engineered by the evil SPECTRE Organisation to hold the world to ransom by means of a devastating act of nuclear terrorism. His involvement leads him from England to the Bahamas and the South of France, pursued by the beautiful but deadly Fatima Blush (Barbara Carrera). Eventually Bond's travels lead him to an encounter with the SPECTRE No. 2 Largo (Klaus Maria Brandauer), probably the best villain ever to grace a Bond film, and his enigmatic mistress Domino (Kim Basinger). Bond understandably falls in love with Domino who has been cruelly misled by the sinister Largo. Will Bond save the world? Aided by a fine and witty script, marvellous stunts and locations and superb characterisation, this is indeed a landmark in movie history. 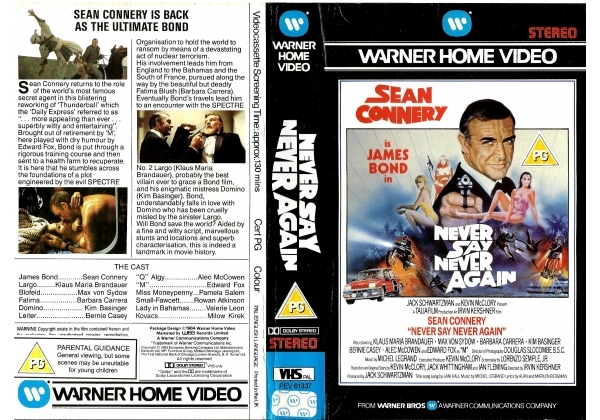 Or find "Never Say Never Again" on VHS and DVD / BluRay at Amazon.